Double boilers are the perfect, multipurpose tool for efficiently removing and refining wax. They provide an excellent way of cleaning wax cappings, removing wax from old foundations and previous cleans of the trimmings. Aside from these practical purposes, double boilers are also a great devise for heating honey and preparing wax for use in making candles, cosmetics and hot-process soap (more information on a boiler’s many functions can be found at Double Boilers: The Perfect Wax-Cleaning and Emulsifying Tool). 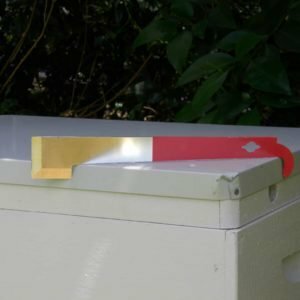 With a seven-litre capacity they are the perfect size for small ventures of one to five bee hives and are suitable for products that require melting temperatures up to 85°C. Each boiler comes with two stainless steel taps and water jacket bridging pipes, and one brass water jacket drain tap. The boiler is heat controlled and designed to use on a standard 10-amp power point with a safety switch. Easy to maintain and fully serviceable, this double boiler is an excellent investment for your hobby or small business, as the often-arduous task of removing wax is made simple. · Unit overall dimensions: H42cm x W30cm. · Product outlets (tap) heights 22cm & 26cm measured up from the unit’s base. · Bottom Internal tap outlet sits approximately 1 cm from the pot base on the inside of the product pot. · Top tap is the wax/product outlet, bottom tap is to empty the water jacket. · Cold start to 100°C in approximately 30 minutes. · Cold start to 70°C in approximately 20 minutes. · Unit Power 240v/2300w – AS/NZS31122011 240V 10amp complies with Australian Electrical Standards. 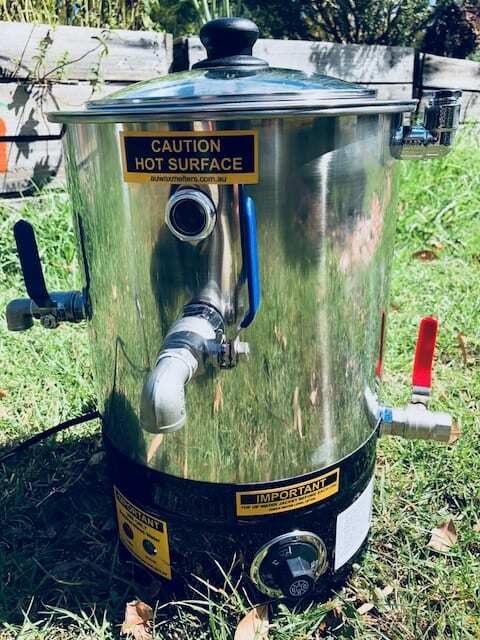 An electric double boiler is a stainless-steel unit with a water jacket that runs around the outside of the internal chamber, a thermostat to control heating to a set temperature, and an electric heating element to heat the water in the water jacket. The wax or waxy product goes into the internal chamber and the heated water in the jacket melts, emulsifies and/or separates the wax depending on the product being used. The outlet or tap will not clog because it passes through the water jacket and is surrounded by hot water that is heating it. Throughout the process, the temperature is maintained by the thermostat, continually allowing the user to spend more time perfecting the finished product. 1. Fill the water jacket with demineralised water. Demineralised water is a low-cost product that can be purchased at supermarkets and hardware stores. Once filled the water is left in the unit and topped up as required. 2. Plug into a power outlet. 3. Select desired temperature on the thermostat. 4. Heat unit up to temperature. 5. Add wax/product and heat product to required temperature. Cleaning wax from dirty wax cappings, old foundations and previous cleans is easy with a double boiler. Add water first to the chamber, fill to just above the top tap outlet. Add wax cappings, old foundation and wax from previous cleans to the chamber. Set the temperature to between 65°-75°c for the water jacket. Do not exceed 80°c as at these higher temperatures the wax will discolour. Best results are achieved with a slower melt time, ideally running the unit at a lower temperature (65°-70°c) for 8-10 hours. This will allow the wax to melt, and gravity to separate the liquid layers at different densities. As water and honey are heavier than wax, the wax will float to the top of the chamber. Any debris will tend to sit within the water or just below the wax line (between water and wax). It is therefore important to not stir the contents once the wax has melted and separated. Once everything has melted, separated and settled, and before opening the taps, carefully skim any debris that is floating on top of the wax, taking care not to stir the contents of the chamber. Open the lowest chamber tap to drain off the honey-rich water until you see the colour and viscosity change and wax starts to come out. At this point, close the bottom tap—the wax line should now be below the top chamber taps. Allow the contents that has just been drained to cool; any wax will solidify on top. This wax can be recovered and added to the next batch to be processed. Once this process is complete, move to the top chamber tap. Depending on the temperature that you have the unit set to, you may need to apply an extra heat source (electric hot air gun or hair drier) to the outlet, allowing any solid beeswax to melt within the tap. Use a small container to check if clean wax is coming out. If the wax is still dirty, allow it to settle for longer or drop the level further with the bottom chamber tap. Once wax is pouring clean, you are ready to use your wax. 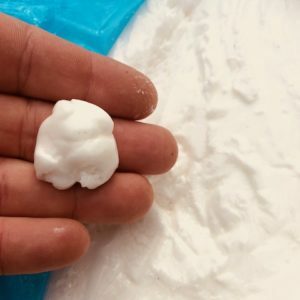 Drain clean wax straight into a pouring jug or moulds until the clean wax is exhausted. Repeat the process until all cappings and old foundation have been used. Your will know it is time to clean out your double boiler if there is a build-up of pollen or debris in the bottom of the chamber. Please keep in mind that it is not recommended to clean brood comb in the unit as brood comb generally contains a lot of debris, including cacoons which can clog the tap. Reducing and cleaning straight cappings is basically the same process as cleaning regular wax. 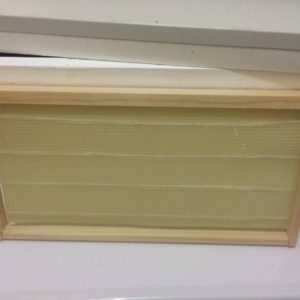 However, clean water should not be added to the chamber as wax cappings have enough honey to melt and separate between the bottom layer of honey and the top layer of clean beeswax. In this process, the honey recovered from the cappings is therefore just heated honey and not honey rich water. This honey has many uses, and is commonly used for sauces, cooking and making mead through a special fermentation process. As well as cleaning and emulsifying wax, your double boiler can also be used to heat honey. Firstly, and importantly, set the desired temperature and allow the unit to heat up before placing honey in the chamber. For larger models (25-35L) 10L and 20L buckets of candied honey can be gently lowered into the unit. Set the temperature to 60°c and run for 24 hours. After this time, the honey will be completely liquefied within the bucket. Lower temperatures will take longer. Please note that honey heated above 40°c is no longer considered as “raw”.